This vintage real photo postcard features French theatre actress Gabrielle Rejane standing on the sideboard of her chauffeur driven limousine. A little boy (most likely her son) peaks over her shoulder at the camera. The car in this photograph is beautiful, as was Rejane. 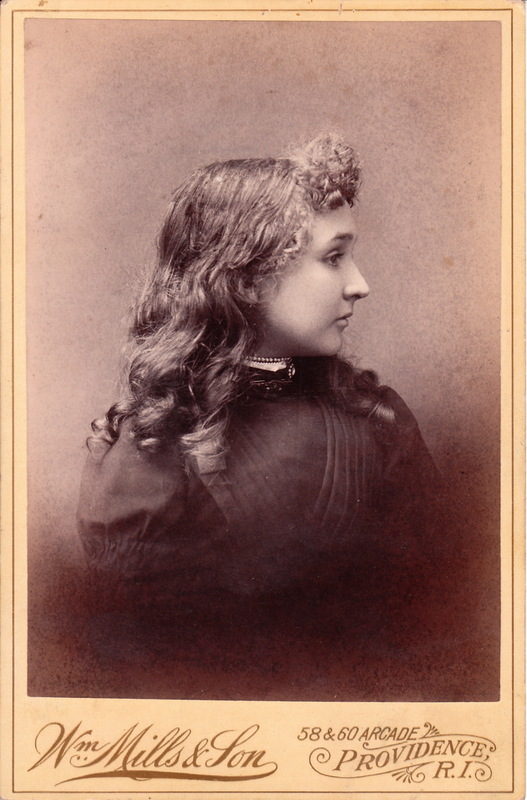 A cabinet card image of the actress can be seen below. The photograph was taken by celebrated photographer Felix Nadar. Gabrielle Rejane was the stage name employed by Gabrielle-Charlotte Reju (1856-1920). She was born in Paris and had theatre in her blood as her father was an actor. She studied under Regnier at the Conservatoire and excelled in comedy. She made her debut in 1875 playing a number of “soubrette parts. Her first major success was in Meilhac’s “Ma Camarade (1883) and she quickly became known as a talented emotional actress. She played roles in “Decor”, “Ma Cousine”, and “Lysistrata”. In 1892 she married M. Paul Porel, the director of the Theatre du Vaudeville. The marriage lasted twelve years. In 1893 she appeared in Paris and soon thereafter she appeared in her most famous role as Catherine in Sardou’s “Madame Sans-Gene” in London and New York. In 1906 she opened the Theatre Rejane in Paris. She and Sarah Bernhardt served as the models for the character of the actress Berma in Marcel Proust’s novel “In Search of Lost Time”. Gabrielle Rejane’s acting is thought to represent what wikipedia describes as “the essence of French vivacity and animated expression”. Rejane appeared in a number of short films during the pioneering days of early cinema. Réjane died in Paris and is buried in the Cimetiere de Passy. Her obituary appeared in the New York Times (1920) and it was chock full of praise including; “She was the supreme comedienne of her time.” The image of Me. Rejane seen on this postcard was photographed by Paul Boyer (1861-1908) of Paris. He invented the use of magnesium for the flash in photography. He also was a very talented and award winning photographer. His studio was located at 35 Boulevard des Capucines in Paris. He produced many portraits of theater actors and actresses as well as other celebrities of his time. This postcard was published by Societe Industrielle de Photograpie (SIP) of Rueil, France and was part of a series (no. 2000).The postcard is addressed to Lyons, France and the writer of the message written on the card dated it 1908. This postcard is particularly special because it is a rare image of Gabrielle Rejane. A very pretty girl poses for the photographer at the studio of William Mills and Son in Providence, Rhode Island. This side-view pose is reminiscent of the typical pose assumed by famed actress, Sarah Bernhardt. The subject of this photograph has a very interesting and attractive profile making this particular posing position a good choice. There is no identifying information accompanying this Cabinet Card and it is not clear whether the subject is a teenager or adult woman. To view other photographs by the Mills Studio, click on the category “Photographer: Mills”.